I'm writing this post to communicate some reasons why I think treasuries may not be the giant bubble that many people claim. My thoughts here should not be taken as investment advice — you should use your own judgment and decide where I might be wrong. Rising inflation or hyperinflation, i.e., the prospect of inflation-adjusted returns on current bonds being negative. Threat of default as government debt grows substantially and investors question whether it can be repaid. Ongoing new treasury supply from budget deficits and bailouts swamping the bond markets and forcing up interest rates. China deciding to stop buying our treasuries. I'll provide some thoughts on each, though my perspective on #3 I have not seen detailed anywhere else, which suggests it is novel, wrong, or simply something that no source I read has bothered to explain in detail because they thought it obvious. On the prospect of wrong — with so many other ideas in economics proving utterly fallacious, I'm not going to rule out it being correct until I see good evidence, especially since the conclusions are in line with historical experience. Please see the related post that explains my perspective on this crisis. It is key context to the arguments here as it presumes no quick "return to normal" is feasible given the magnitude of the asset bubbles that are unwinding. It assumes a long "balance sheet recession", contracting aggregate private debt, and that this is at the core a crisis of solvency not liquidity. If you disagree with this outlook even after reading the explanatory sources I reference, you will likely disagree with much of this post. It's not clear to me why so many commentators (even those who believe this crisis shares the same underlying dynamics as these historical precedents and will not end quickly) ignore the historical record by asserting treasury issuance will force yields and interest rates up. I have yet to see an explanation of which specific differences this crisis has that would lead to a completely different result for longer term interest rates. Yes, the magnitude of the unsustainable debt load is far larger this time, but does that necessarily imply a tipping point in what happens to interest rates? I have not seen such a tipping point described, other than prospect for default (to be discussed). Amazingly Japan's government bonds even rallied (i.e., yields declined) during its crisis in the context of a declining household savings rate [graph] (the rate dropped from around 15% in 1990 to around 3% in 2008), though Koo's graph above suggests that when corporate debt repayment is added, private sector savings increased on aggregate. The US household savings rate is expected by many [e.g., see CR] to increase from recently being negative to roughly the historical 5-10% range, which may be a relative benefit for the US compared to Japan in terms of finding buyers of treasuries, depending on the size of changes on the US corporate debt side. To make a serious dent in debt levels, and thus enable the increase in base money to affect the aggregate money stock and hence cause inflation, Bernanke would need to not merely double M0, but to increase it by a factor of, say, 25 from pre-intervention levels. That US$20 trillion truckload of greenbacks might enable Americans to repay, say, one quarter of outstanding debt with one half—thus reducing the debt to GDP ratio about 200% (roughly what it was during the DotCom bubble and, coincidentally, 1931)—and get back to some serious inflationary spending with the other (of course, in the context of a seriously depreciating currency). But with anything less than that, his attempts to reflate the American economy will sink in the ocean of debt created by America’s modern-day “Roving Cavaliers of Credit”. According to this view, inflation will take years to return, and when it does, it most likely will return slowly as individuals and companies start to gradually borrow more again, expanding aggregate private debt. 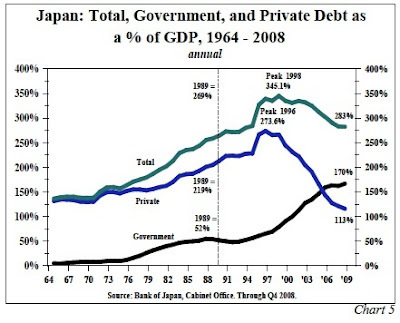 [UPDATE 7/14/2009: In Japan, private borrowing has yet to begin expanding again since it peaked — see the blue line in the graph below. Note, I removed Steve Keen's chart that was included here previously as his Japanese private debt data may be incomplete, and replaced it with the chart below.] A key point is, when the private sector is deleveraging, printing money is actually deflationary as it is used to accelerate repayment of debts, unless you print truly huge amounts and effectively target those with the highest propensity to spend. But those are usually the same people with existing debts and even if you give them all mall gift cards, money is fungible so they can still use the cards to buy food and then pay down debt with the money they saved. Now I'll admit that 30 years is a long time and a lot can happen in that timeframe, so long term treasuries are the riskiest duration with respect to possible negative inflation-adjusted return. However, it's not a clear cut case given the historical precedents of Japan and the Great Depression. Plus, markets have proven over and over that they do not always properly foresee and price in long term outcomes! So hunger for "safe" yield could cause them to rally for years before eventually declining many years from now. Too much slack in the economy to worry about inflation: The fact that the Fed can state this view, knowing full well that it has dramatically expanded its balance sheet and the money supply, is a testament to the view that the central bank has been leaning against the winds of deflation rather than creating inflation. In our view, the latter will be practically impossible to do in an environment where the underlying unemployment rate is approaching 16% and capacity utilization rates are at all-time lows of 66%. There is simply too much slack in the economy, in our view, for us to be worried over the prospect of inflation or a sustained bear market in bonds. 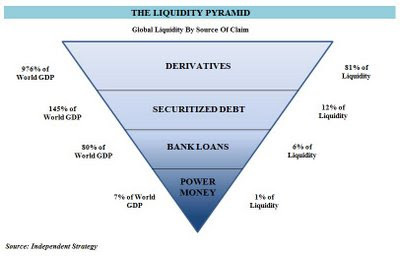 "...the securitization of debt, and creation of derivatives amounted to a huge virtual printing press, primarily fueled by a massive increase in risk appetite which allowed for a huge expansion in the value of claims on financial assets and goods and services. It is worth pointing out, that the Fed has little to no control over this "printing press" at this point, which at last count was responsible for over 90% of the liquidity in the system." Looking at the historical record, Japan started its crisis around 1990 with a government debt-to-GDP ratio of around 55%. That has since tripled to around 180% (I'm not sure why Richard Koo's graph above shows 140% as I always read elsewhere 170-180%), yet yields are much lower now than in 1990, and the credit default swap market has been pricing the risk of Japanese sovereign default as very low, generally around the lowest of G7 nations. In the Great Depression, US government debt-to-GDP rose to around 130%, again concurrent with interest rates declining. Britain ended World War II with a ratio of 250%! (See the graph below). Yet it managed to pay down this debt. (Note that I read somewhere, though haven't confirmed, that some UK bond coupon rates were forcibly repriced lower, which some have called a form of default, though as far as I know the full principle was returned, plus partial interest). 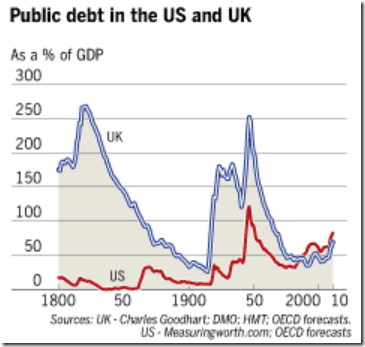 The US started this crisis with a 60% government debt-to-GDP ratio (or 40% debt-to-GDP actually held by the public). If it rose to Japan's level of 180%, that could reflect an additional $17 trillion of treasury issuance ($14 trillion GDP * 120% additional debt). The US private debt-to-GDP ratio is around 300%, so there is certainly no way that the government can or should swap all private debt for public debt. The biggest threat to treasuries in my opinion would be for the government to truly take on too much, of the order of $20-$30 trillion or more. But that seems very unlikely given how difficult it was to pass the stimulus bill and the TARP. Congress and the public have a very limited appetite for bailouts, so far. PPIP (Public-Private Investment Program) is an attempt to bypass Congress (in part by using the FDIC to lend, since the public won't want to see the FDIC fail therefore it will get any extra funding it needs) but it remains to be seen whether PPIP works and how big it can get. To put a little caution to my own historical examples — I think a 250% public debt-to-GDP would be much harder to grow out of in the 21st century given how much demographic growth has slowed since mid 20th century, but the point is that 250% is still much bigger than 40-60%. One more related caution — it seems likely that Japan's high government debt is a drag on their growth at this point, whether or not adding to it in response to their crisis was the right thing to do, as simply servicing it (let alone paying it off) must eat up a lot of tax revenue. Yet the markets certainly aren't pricing in Japanese government bond defaults. Not all of the commitments so far will be used as some reflect guarantees and not all guaranteed assets should lose 100% of their value. Note how much smaller these actual expenditure numbers are so far than Japan's eventual expenditure as a percentage of GDP. Of course, much more will inevitably be committed in coming months and years. 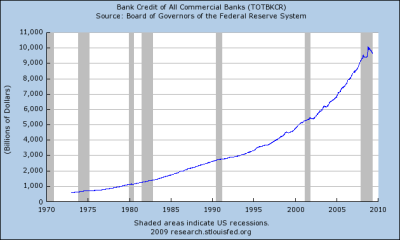 Also, many of the Federal Reserve programs (loans, etc) lead to an increase in the banks' reserve accounts with the Fed, on which they are now paid interest. Paying interest on reserves (see some details on this in the context of the Fed's balance sheet at econbrowser) is an effective sterilization alternative to issuing additional treasuries via the Treasury Supplemental Financing Program, and means not all Fed programs (perhaps only a few?) lead to an increase in treasury debt issuance. Shrinking aggregate private debt allows public debt to fill the "gap" without crowding out. Increased domestic savings increases demand for treasuries. Bailout money does not disappear into a void — it persists on balance sheets (despite write-downs) and since it most likely replaces fixed income assets it will have a high propensity to generate demand for new fixed income assets. Money markets (cash) buy a lot of Treasury bills. Quantitative easing generates treasury demand and reduces treasury supply. Increased flight to safety as the Great Deleveraging progresses. Arbitrageurs maintaining "logical" spreads between various fixed income types (corporate, government, etc), though in the real world in which the efficient market hypothesis is deeply flawed, this factor probably doesn't contribute much. The idea that the growing treasury bond issuance will compete with and starve other asset markets and/or force up interest rates seems to assume two things that I question. First, it seems to assume that all this money raised by government debt issuance disappears into the void and no longer participates in asset markets. Second, it seems to depend upon the notion of us returning to a "normal" environment in the near future in which qualified private demand for loans continues expanding like it has during the last several decades, leading to aggregate expansion in bond issuance that will compete with treasury debt issuance. But if instead private debt on aggregate is shrinking as Steve Keen and Richard Koo and others expect, the increase in government debt is likely to simply replace the disappearing private debt, and not have a large effect on asset prices or interest rates. In other words, with the same aggregate supply of debt assets (private debt plus government debt) and the same broad money supply (it may shrink but quantitative easing may offset that), then the price of assets relative to debt wouldn't necessarily change over the medium term unless other factors cause a repricing. Yes, prices are set on the margin, and I'll discuss below why marginal demand may keep up with marginal supply, but I think the aggregate supply of assets relative to money supply also matters, especially when measured over years rather than months (a lot can fluctuate short term). Among the separate factors that can of course change are expectations on what prices should be and hence relative supply and demand for the assets at each given price point. But that factor is somewhat independent. I'll go through some scenarios as a thought exercise to illustrate how new treasury supply may have a high propensity to increase treasury demand. These are generalized examples not exactly matched to the specific programs in place now, but I believe the principles carry over from a balance sheet perspective. Calculated Risk recently provided a couple good graphical primers on how balance sheets work here and here. Mine will not be so pretty so his may be worth a look first. Also here is a guide to how write-downs work from CreditWritedowns. An increase in the US savings rate is contributing to a shortfall in aggregate demand and a corresponding shortfall in tax receipts. While I won't get into the controversial topic of what should be done from a policy perspective, it is feasible for the treasury to increase spending to fill that gap and issue treasuries to fund the spending. The treasuries are likely to be bought by Americans via the increased savings rate. Part of the reason is that there will not be a net increase in private assets looking for buyers in the context of the private sector paying down debt faster than new loans are made. Richard Koo directly addresses (in the video more so than the slides) how increased savings will fund sovereign deficit spending in his October 2008 talk. Note that the treasury debt is funded not just by bonds and notes with the duration counted in years, but also short term treasury bills that are bought by many money market funds — so as far as I know even cash savings added to money market funds help fund treasury debt issuance. The public debt breakdown on wikipedia shows as of December that $1.9 trillion out of $6 trillion in issuance is treasury bills. Now, the question is what happens to that extra $50 in cash on the asset side. My expectation is that it could lead to an almost corresponding increase in demand for treasuries of some duration. This would give the $50 in cash back to the broader market (from which it originally came before the treasury issuance) and put the new treasuries on the balance sheet of the bailed out company. The net effect is essentially the same as if the government directly traded treasuries for toxic assets. I'm not suggesting any of this is fair or commenting on what the "right" solution is — on the face of things there is little good to be said for the taxpayer having to send a stream of future income to companies that made big profits acting irresponsibly during the asset bubble years. Here are some possibilities for what happens to that money from the government. If the company keeps it in cash, whatever funding vehicle holds that cash will need to purchase $50 more of whatever underlying instruments the vehicle holds. I don't know what all the typical options are here but at least some could be expected to go to purchasing short duration treasury bills. If the company wants to earn more than the yield from cash, it will likely look for some other fixed income investment to replace the toxic assets it held. There will continue to be little trust as to the valuation of other private securities on offer in the market, and treasuries are the largest and most liquid market in the world, so that alone provides some support for $50 of treasuries to be purchased. But more importantly, there won't be new private loan assets on aggregate competing for buyers because private debt will still be contracting as people pay back loans faster than taking out new ones. So the $50 increase in treasury supply from when the government raised the cash may temporarily force up treasury yields relative to other assets, which will immediately make them more attractive relative to other assets, and cause an increased propensity for them to be purchased as part of an arbitrage trade by the bailed out company or other market participants. (I acknowledge that arbitrage is unlikely to fully rebalance things as markets aren't completely omniscient/rational, but I would think arbitrage should do better at maintaining spreads within one asset class than prices between different asset classes.) Now it is true that the credit worthiness of the government goes down marginally each time it issues new debt, but I suspect the difference in total government debt relatively speaking at each increment will be so small that the market won't care much in terms of setting relative spread between bond types. It is possible that the company could choose to purchase other assets (stocks, gold, etc), but it seems that it would have a high propensity to replace one fixed income asset with another fixed income asset. Even if some buyers chose gold, for example, ongoing economic stagnation and a need for income could drive them back to dividend paying fixed income assets. Having assets that provide cash flow is likely especially important for companies such as banks and insurers that will need ongoing income to help keep their balance sheets solvent amid other asset write-downs. Unless they are bank loans (credit created through fractional reserve lending), these paid down liabilities (most likely bonds) will lead to a corresponding increase of the assets of another company or individual that had provided the money. This company/individual then faces the same choices as the one bailed out: invest the cash, buy higher yielding assets, or pay down debt. But even if multiple companies deleverage down a connected chain, eventually the process will stop at companies or individuals with no need to pay down debt, leaving them holding cash or buying other assets. Decrease in bank credit (fractional reserve lending) — however in the US this is the minority of debt (Alea reports 63% of GDP in bank credit and 168% of GDP in direct debt securities. This doesn't quite add up to the 300% of private debt-to-GDP so something is missing). Propensity to put increases in asset side of balance sheet in non-treasury assets. I suspect this will turn out to be low when deleveraging fully takes hold. Let's assume a situation to start in which the amount of both public debt (treasuries) and private debt are not changing over time. Absent any other external factors, the marginal supply and marginal demand for all debt assets on aggregate will stay roughly balanced with each other, and contribute to setting a price that will be somewhat stable. Now let's assume the Treasury is issuing more public debt over time. This step will increase marginal supply and push down prices. Then let's say the mechanics explained above come into play (the high propensity for the cash to find its way to treasury purchases) and half (but not 100%, to be realistic) of the bailout cash generates increased marginal demand for treasuries. That will push up prices again but not all the way to the original price level, so they are still lower absent other external factors. Now let's assume the aggregate supply of private assets is decreasing over time. For example, as homeowners pay down their mortgages, loan assets will convert to cash on the balance sheet of the holders of MBS (mortgage backed securities). With homeowners on aggregate paying down debt faster than adding new debt, the marketplace won't offer a lot of new MBS or other loans opportunities as a replacement. So let's say half of this cash stream is then used to buy treasuries for the same types of reasons discussed previously. This will again push up treasury prices, potentially taking them back to around the original price level. Perhaps the additive effect of both these factors by which marginal demand for treasuries might increase, combined with flight to safety, is enough to explain why yields declined (i.e., prices rose) during past balance sheet recessions. The above scenario isn't meant to be mathematically rigorous, it is just a rough sketch of how contracting private debt may play a role in filling the previously mentioned gap. Here is a scenario for how a company being recapitalized by the government should similarly lead to an increased demand for treasuries. Note that the writedown shrunk the toxic assets on the left side of the balance sheet and the equity on the right side, but didn't touch the newly injected capital on the left side. So that capital is free to participate in purchases of new assets or in deleveraging by paying off debt, just as in the previous example that covered toxic asset purchases by the government. There is a very widespread sense that the US “needs” China more now because it is issuing more Treasuries to finance its fiscal deficit. That isn’t quite true. As a result of the crisis, the US consumer has started to save and American businesses have reduced their investment, so the US “needs” to borrow a lot less from the rest of the world. The US needs to borrow from the world when private Americans do not want to save and the US running a large trade deficit, not when private Americans want to save and the trade deficit is down. The US Federal Reserve has already embarked on quantitative easing, and it is expected by many to continue for a long time and increase in magnitude. Japan tried this several times as well. The expected effects are controversial. One view holds that the ongoing increase in marginal treasury demand from the Fed can help match the marginal supply increase due to new treasuries being issued, and keep yields lower than they would otherwise be. In addition, this operation results in a lower supply of treasuries held by the market, potentially having a lasting effect on prices (i.e., keeping prices higher as those treasuries stay out of trading supply). Some raise concerns that eventually those treasuries need to be sold back to the market and the market will price in this expectation, but if we might be in a lower leverage higher regulation environment for decades to come, it's not certain that the Fed will ever need to do this -- the increase in base money supply might not be inflationary even in the medium term if systemic leverage (i.e., broader money supply and credit) does not returns to previous levels. Also while the Fed holds the treasuries, all interest payments on the debt are effectively returned to the government, so this lowers the servicing burden of the aggregate government debt and lowers the probability of default being necessary. 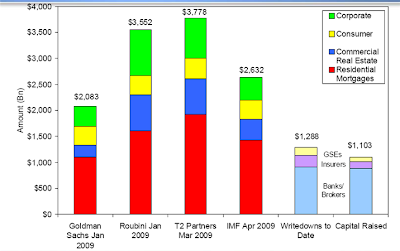 The potential for significant political instability as a result of the crisis could lead to very unpredictable consequences (intentional default on government debt even if it is serviceable, printing such truly massive amounts of money targeted to those who would spend it that it would cause high inflation, etc). A huge supply shock (energy, other natural resources, labor, etc) could potentially ignite meaningful inflation, though for it to be more than a one time jump in price levels, wage inflation would have to take hold as well, which is unlikely in today's globalized labor market (but that could change). I'm not sure just how large current underfunded obligations like social security really are, and what impact this will ultimately have. Perhaps my logic in this post is just plain wrong.